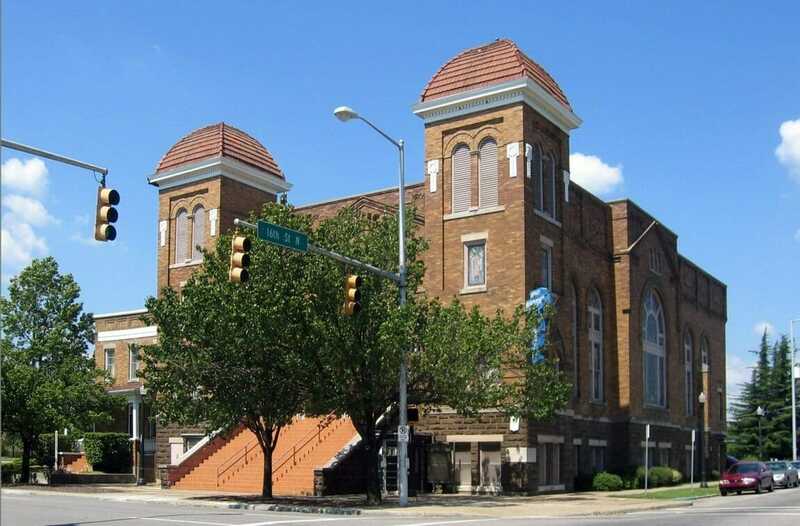 One of the most critical parts of both the historic and present African American community here in Birmingham will comprise your next stop, the Civil Rights historic hotspot being the 16th Street Baptist Church. This church first opened in 1911, though the force behind the church was first founded in 1873 (First Colored Baptist Church of Birmingham). 16th Street Baptist provides both a unique history to the religious community and civil rights activists here in Birmingham and also a current icon of a community still thriving here within the church today. This spot was the very first black church in Birmingham, a church that dealt with banishing segregation and historic civil rights victories, not before going through its fair shares of trials and tribulations along the way, though. Today you will see the church with the twin towers with pointed domes, the iconic cupola over the sanctuary, and the large basement auditorium lined with classrooms. You will also see a large stained glass window designed by John Pelts, as well, each bit of the design iconic and memorable pieces of a much larger Romanesque built masterpiece. There are current services, sermons, and bible studies/community events that take place here, as well as daily tours to discuss the turbulent history. The tours are only $5 and walk you through the history, discussing key events like civil rights rallies and the big 1963 church bombing/arson case, which completely destroyed the building, left 20 injured, and even left 4 children dead. This church is dedicated to ‘life changing and world changing messages on which [they] built [their] church and lives’, holding a strong history important to the state, nation, and black community as a whole. Learn about people like WEB Dubois and Mary Mcleod while here, also, both key speakers in this church's history during the civil rights movement.